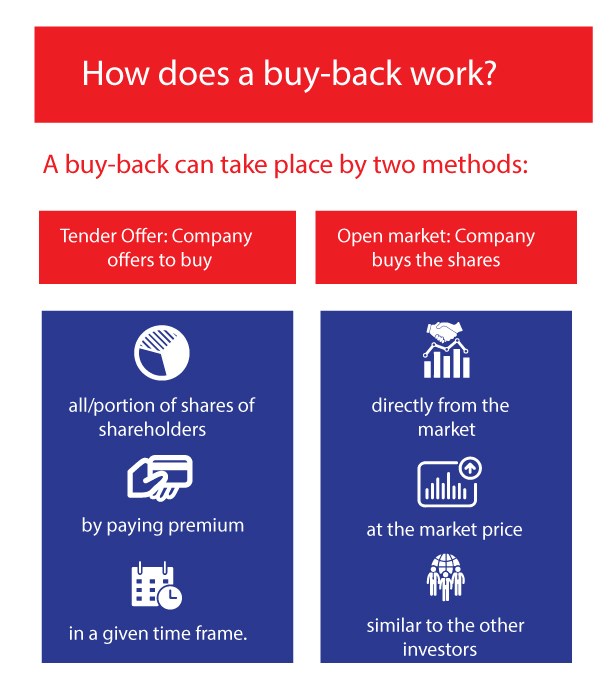 How does a buyback work? Buyback is the repurchase of the outstanding shares by the company. A buyback mostly results in a rise of the stock prices if the profits are duly maintained. Companies may use the excess cash in buyback instead of investing in alternative investments. It is often seen in the market that companies buy their own outstanding shares, a practice termed as buyback. This exercise is driven by multiple reasons, one of which is to boost the price of the shares. Before understanding how a buyback works, let us see what a buyback is and the why does it happen. Why do companies buy back? To boost the shares’ price: By buying back shares, the number of outstanding shares decreases, causing a shorter supply for the existing demand, thereby increasing the price of the stock. To maintain controlling stake: Sometimes to maintain a controlling stake, the company has to buy back outstanding shares. Tax benefits: Buyback is taxed as capital gains which are 10% if kept for more than a year and 15% for short-term. On the other hand, the dividend is taxed as per the Dividend Distribution Tax at 28.84%. This makes buyback a tax benefitted way to reward shareholders with better returns on their investments. Excess cash: At times, the company has excess cash and decides to invest in the company itself via buyback instead of any alternative investments. This ensures the strengthening of the company assets (stocks) value for the long-term. Tender offer: In this case, the company offers to buy all or a portion of the shares that the shareholders hold by paying a premium. This premium price is generally higher than the current market price. A tender offer is a limited period offer with a pre-determined time frame up to which the investor can sell their shares to the company under the given offer. A tender offer is generally declared by the company when they are trying to acquire a controlling stake and require a large number of shares in smaller time duration. Due registration fee is charged when a company files a tender offer. Open market: The other way in which the company decides to buy the shares back is via open market. In this way, the company acts as any normal investor and accumulates shares for buyback. However, upon the announcement of the buyback, the price of the stocks normally increases due to the market sentiments. But for directly buying back shares via open market, no registration is charged as in the case of a tender offer. This way company accumulates the shares it buys from the shareholders and if the reason to buyback is only for boosting the prices, then they tend to sell them back in some time once the prices increase significantly. If the reason of buyback is to acquire a controlling stake, then they do not sell the shares back later.